a Canadian company proudly servicing Ottawa & Eastern Ontario for over 40 years! We can configure and build bath or shower entry systems to meet and exceed your design and lifestyle needs. Glass is what we do best! From replacement window glass to custom glass like table tops, decorative glass, glass repairs, and more, we do it all. We carry a variety of decorative mirrors, and we install mirrored doors and walls, manufacture custom mirrors, and even repair and replace damaged mirrors. Our hardware experts will do their best to help you find what you’re looking for. In-stock, supplier order, or research for the hard to find, we’ll take the time! Get the custom-made glass shower enclosure you’ve always dreamed of! From design to execution, our Ottawa glass specialists will make it happen. See what others are saying about M&T Glass! We have had an excellent experience with a very tricky window installation, and would like to congratulate Peterson and Jason for their work. It was done with a minimum amount of mess, all of which was cleaned up before they left. Review: Very satisfied with service and attention to details. Sheldon is a very knowledgeable person and always courteous. It is a pleasure to deal with him and M&T Glass. I wanted to send a quick note to you; while you’re on vacation, to let you know your guys did us a great solid! This past Friday at about 2pm a car drove into a window at our detail shop, I did the first thing that came to mind and called you. Oh oh you were on vacation! Luckily Jeff came to the phone, sent over a team and had a temp window in within and hour and a half. Pretty impressive for the afternoon before a long weekend. Thanks and please pass along this to your guys. Back in April, I ordered two glass panes from M&T Glass. People often take the time to voice their complaints, but it is equally, if not more important to offer positive feedback. I am late in writing this, but I have to say that Jeff was very courteous and helpful. I wanted to also particularly thank the Techs, they were amazing!!! There were issues with my old panes being glued and other difficulties, and they worked extra hard to make sure the job was well done. And they were extremely pleasant. The mirrors you installed in my gym look great! As a new first-time homeowner, I haven’t had the need for repairs up until now. Not knowing where to start I asked a couple of my friends and family. Funny enough everyone said to call M&T Glass and, that was enough for me to contact you. As I didn’t have your number I went to Google and your website popped right up on my phone. Although I expected to have to call, I saw the “Request a Free Estimate” so I clicked. I filled out a few lines, described my problem and you guys took care of the rest. Keep it up and I’ll be a life-long customer. Thank you! M&T have been serving me for over 10 years now with all sources of parts and materials. Never seems to amaze me in always having older parts available when in your you think it’s not possible or available. It’s great. The glass door enclosure for our new shower looks fantastic!! Your employees were always so courteous and cleaned up so well once they were done. Thank you for the great work! I just wanted to let you know that I was really pleased with the estimate that Andy MacEwan provided for mirrored glass doors for my daughter’s closet. Andy explained all the options and I found him to be very knowledgeable and helpful. I’ve already let a friend, who’s looking for a barn door for her closet (Shannon), know about how happy I was. We’re looking forward to getting them installed. Jeff, thanks a lot for sending us your professional people to install the windows today. The installation went very smooth. The purpose of this letter is to thank you and your staff (Gilles and Mat) for the wonderful job that was done at our home this past couple weeks. I would like to express my appreciation for the hard work and outstanding quality of service provided by you and your staff that was completed in an extremely timely and professional manner with very little disruption to our home. Courtesy, cleanliness and everybody’s sense of responsibility was most appreciated. Once again, I would like to extend our thanks to you and your staff on a job well done! We would definitely use M&T Glass again and we would not hesitate to recommend them Matt to anyone else. I dealt with Sheldon today regarding the parts I needed to repair my casement windows. I just sent out a posting on my Facebook telling all my friends about my experience and recommending your company. It’s not often you get this level of service anymore these days. Kudos to Sheldon and M&T glass! My small renovation company (Vantage Renovations Inc.) has relied heavily on M&T Glass to specify, quote fairly, supply and to install top quality products. They always come through making me look very good in the process. I have been a customer for decades. It is with great pleasure that I add my name to the others recommending M&T Glass. We’re proud of the products we carry and the work we do and we'd love to show you! Please browse our gallery at your leisure, or come by for a visit! We wouldn't be where we are without our valued customers, who have come to expect a certain level of quality, professionalism, and terrific results with each and every job we do. That's why our staff is composed of some of the most knowledgeable individuals in the industry working hard to make sure you're satisfied every time. No, it doesn't mean we are perfect, it just means we're dedicated to keeping our customers happy. At M&T Glass, we're more than just glass. We’ve been proudly serving the Ottawa area for over 40 years. 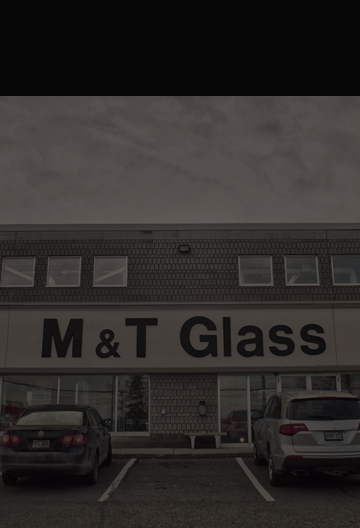 M&T Glass has proudly served the residents, businesses, and institutions of Ottawa and Eastern Ontario since 1964. In that time we’ve developed a reputation to be proud of—a reputation for superior customer service, versatility, and above all, quality craftsmanship. Our crew is made up of dedicated men and women who promise to work hard to earn and keep your business. Our Ottawa glass experts are located on Cyrville Road in Ottawa, just a couple of minutes away from the St. Laurent Shopping Centre, but our service area extends out to the surrounding areas, including Carleton Place, Stittsville, Kemptville, Rockland, and more. Whether you’re doing the job yourself, or you need support onsite, we're here to accommodate! From installations and replacements to commercial and residential repairs, we’re the Ottawa area’s trusted source for glass-related products and services, and our selection of window, screen, and patio door hardware replacements is second to none. If you’re in the market for new windows, doors, mirrors, or other glass products, or if you need your glass repaired and made to look just like new, you can count on M&T Glass. When you choose us, you’re choosing the same degree of service, versatility, and craftsmanship that we have built our reputation on. What’s more, we also strive to go above and beyond by providing 24/7 emergency service for our customers. Your emergency is our emergency, whenever you need us, we’ll be there for you, 24 hours a day and 7 days per week!